" Lay not up for yourselves treasures upon earth, where moth and rust doth corrupt, and where thieves break through and steal: but lay up for yourselves treasures in heaven, where neither moth nor rust doth corrupt, and where thieves do not break through nor steal: For where your treasure is, there will your heart be also." The beginning: Achtung's Jalk vom Sixtberg, CD. No, he wasn't a Corgi, but he was the dog that introduced me to the wonderful world of dog shows. Jalk was my first "show dog" and my beloved companion for 14 years and I miss him still. 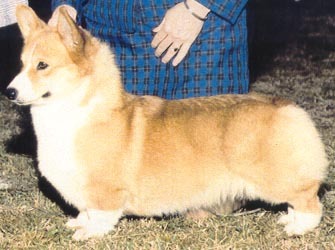 The story of my involvement with Pembroke Welsh Corgis begins below. 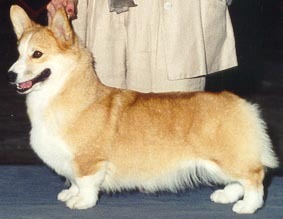 My first Pembroke Corgi was Champion Oldlands Pennywise, CD. My first homebred Pembroke champion was her granddaughter, Ch. Jimanie's Puttin' on the Ritz. Champion Caralon's Chelsey of Horoko. This full sister to Am. Can. Ch. Horoko Caralon Dickens, the top producing sire of all time in the US, was a good producer for Jimanie. She was the dam of four champions: Ch. Jimanie's Sweet Sensation, my beloved 'Baby Cathy', Ch. Jimanie's Super Sleuth, Champion Jimanie's Something Special, CD and Ch. Jimanie's Geronimo. Chelsey's last daughter, Jimanie's Maid Marian, sired by Ch. 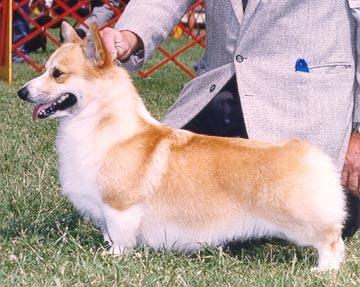 Corgard Jimanie produced several champions Ch. Keebler's Rodeo Reba, Ch. Jimanie's Gunsmoke Doc, Ch. Jimanie's Miss Kitty, just as her dam, Chelsey, did. Marian's daughter sired by "Merlin", Kathie Lee", was lost in June, 2009. She was the kind of dog who didn't ask much of you, didn't demand a lot of attention, but always knew my moods and reacted accordingly. Her daughter, Kissy, has taken her place in the household. Although she doesn't look a lot like her mother physically, she sure has a LOT of Kathie Lee's mannerisms! Her son, Jimanie's Kisses Sweeter Than Wine (better known as "Dino") rounds out the current four Pembrokes in residence at Jimanie (Kissy, Kyle, Hootie and Dino, plus our beloved mixed-breed "Max"). I cannot fail to mention my beloved Gaylyn, Ch. Elfwish Gaylyn. I lost her at way too young of an age to a bad reaction to anesthesia. Of course, I love all of my dogs, but every now and then one comes along that is so responsive to your moods they wind up being what we call a 'heart dog' - one that is closest to our hearts. (Like Chelsey, Marian and Kathie Lee) Gaylyn was one of these. Gaylyn did leave a legacy through her daughter, Ch. 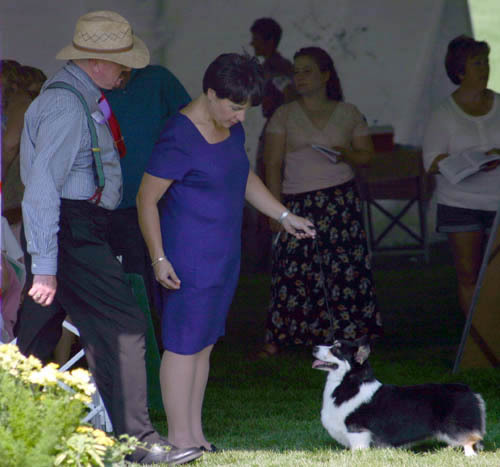 Jimanie's Finnish Affair "Cassie" and Cassie's daughter, Jimanie Honor Keepin' the Faith "Christie" who was by the top winning Pembroke Welsh Corgi of all time, Ch. Hum'nbird Keepin Up'pearances "Kevin". Never to be forgotten at Jimanie is Ch. SaddleLane's Autumn Angel, ROM, whom I co-owned with Linda Galphin. The last thing I did before I was admitted to the hospital for surgery for colon cancer in 1994 was write a check for the purchase of Angel. She produced so well for Linda and I that she earned her ROM (Register of Merit) award from the PWCCA, Inc. One of her daughters is Kyle's daughter, Ch. Jimanie-Foxllyn Angel's Halo, better known as "Morgan". Here is a lovely collage of Angel and her champion offspring. Not to be outdone by the girls, the Jimanie boys have all done well for themselves, too. Currently in residence are both Ch. Llandian Super Sweet "Kyle" and Ch. Sua Mah Always in Cahoots "Hootie". Both boys have been neutered and are living the Life of Riley at Jimanie. No longer with us, but still alive through his grandkids and great-grand children is Ch. Llyswen Foreign Affair at Rumney "Merlin" who came home with me and Linda Galphin after a trip to Crufts. We took a side trip to Wales to purchase Merlin. He was known as the "Welshman" and was the most stunningly beautiful black headed tricolor male I have ever seen. Merlin sired only a few litters in the US before his breeding career ended prematurely. His only show quality son, "Reggie" was whelped by his breeder, Denise Scott. His registered name was Ch. Vache's Pendragon of Jimanie and he went on to be an all breed Best in Show winner as well as a popular award winner at multiple specialty shows. He was coowned by Denise Scott and Linda Stoddard. Merlin's grandson, Jimanie's Phantom of the Opera "Andrew" has returned home to Jimanie and will carry on in his grandsire's footsteps. 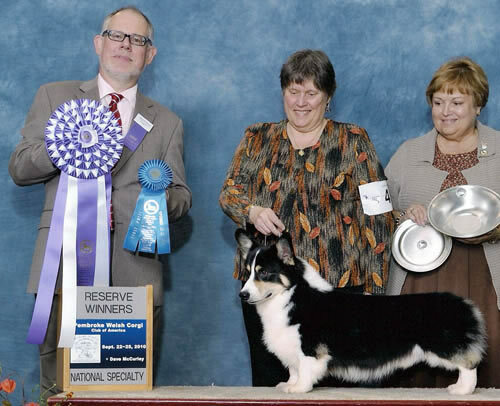 Andrew was seven years of age when he came home and in the first months of his return he thrilled us all by taking 1st in the Bred by Exhibitor class at the PWCCA national specialty in 2010 and then went on to Reserve Winners Dog. Andrew is also co-owned with Denise Scott and Linda Stoddard. He is out of "Kathie Lee" Jimanie's Sweet Talker, whom we lost in 2009 at 14 years of age. Before Merlin, there was the red headed tricolor, Ch. Corgard Jimanie Simply the Best - and his name aptly described him. He was simply the best at everything I asked of him. Also in the mix during the 80's , was Ch. Schaferhaus Yul B a Racing Stripe (a full brother to Chelsey) and Ch. Kraghaus Schaferhaus Jack who was the sire of Ch. Jimanie Barden Billy's Boy, CD. another all-breed Best in Show winner. CH Jimanie's Phantom of the Opera "Andrew"